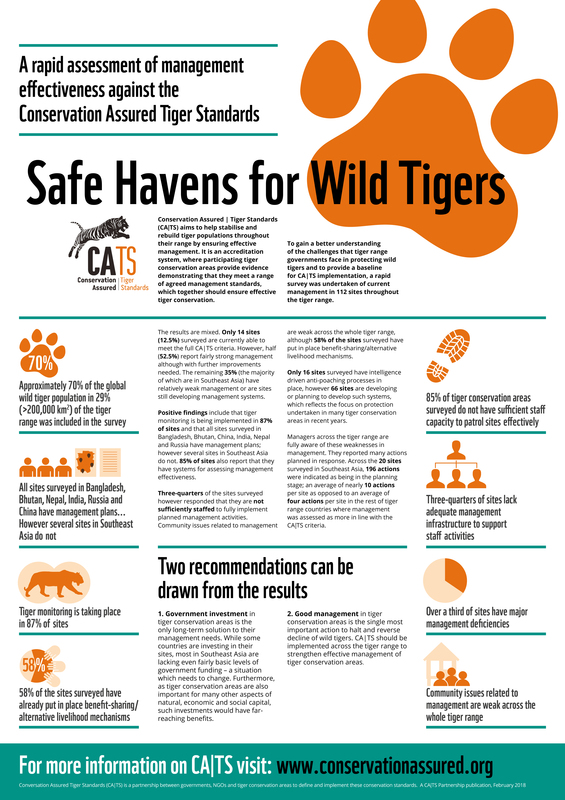 28 February 2018 – A new survey of over a hundred tiger conservation areas, where an estimated 70% of the world’s wild tigers live, found that only 13% of them are able to meet global standards. At least one-third of them are severely at risk of losing their tigers. Alarmingly, most of these sites are in Southeast Asia, where tigers have suffered the most dramatic decline in the past decade. “Tiger is not only an ecologically important species but also holds a significant place in culture and history. It is just unthinkable to lose these magnificent stripes from our ecosystem. Therefore, I urge and request all tiger range countries to reaffirm our commitment to saving tigers for now and for future so that their existence is guaranteed in perpetuity,” said Phento Tshering, Director, Department of Forests and Park Services, Royal Government of Bhutan and Chair, CA|TS Council. Reassuringly, two-thirds of the areas surveyed reported fair to strong management. Yet, basic needs such as enforcement against poaching, engaging local communities and managing conflict between people and wildlife, remain weak for all areas surveyed. The survey, driven by 11 leading conservation organisations and tiger range governments that are part of the CA|TS Partnership, is the first and largest rapid assessment of site-based tiger conservation across Asia. “Bhutan is at the forefront in leading the way for other tiger range countries to follow. The leadership at the highest level is committed to ensuring that tigers strive in Bhutan but there is still a lot that needs to be done in order to ensure that this charismatic species is protected. Effectively managed protected areas will benefit all wildlife. As a result Bhutan’s forests that provide ecosystem services such as clean water, food and medicine will also be protected,” said Dechen Dorji, Country Representative of WWF Bhutan. This World Wildlife Day calls for the protection of big cats, the report acts as a timely reminder of the need to secure the homes of wild tigers and engage local communities, in order to ensure the protection and recovery of this majestic species. 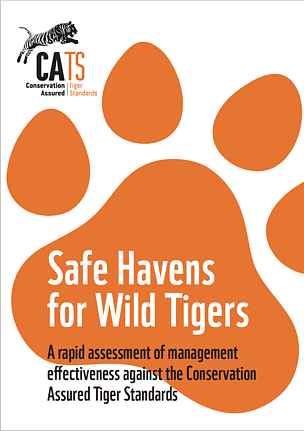 Data from this survey forms a baseline that aims to help governments and site managers understand how they are faring against CA|TS (Conservation Assured Tiger Standards), an accreditation system designed to measure and improve the management of tiger conservation areas. "The results in this report provides a way for countries to make informed decisions in driving tiger conservation forward, helping to lead a sustainable path for parks, people and tigers to all thrive together,” said Sugoto Roy, Coordinator of the Integrated Tiger Habitat Conservation Programme, IUCN. “The tiger’s survival is a critical indicator for sustainable development in tiger range countries – it is intrinsically linked to the integrity of nature and the services it provides, upon which all development rests,” comments Midori Paxton, Head of Ecosystems and Biodiversity at the UNDP. CA|TS was created to support the TX2 goal to double the number of tigers in the wild, adopted at the St Petersburg ‘Tiger Summit’ in 2010. It was established with the aim of ensuring that where tigers live in the wild, they are receiving effective protection and management. Bhutan adopted CA|TS in 2016. Conservation Assured | Tiger Standards (CA|TS) is an accreditation system designed to measure and improve the management of tiger conservation areas. It is driven by the CA|TS Partnership, which comprises of tiger range governments, intergovernmental agencies, conservation organisations and other institutions, including: Equilibrium Research, Freeland Foundation, Global Wildlife Conservation, Global Tiger Forum, IUCN, Panthera, Smithsonian Institution, United Nations Development Program (UNDP), World Commission on Protected Areas (WCPA), WildTeam, and WWF. The secretariat for CA|TS is hosted by WWF.